Everything you need to build, host and manage a website is available at just RM3.18/mo. One free Domain (.com) with purchase of every new Value and Unlimited plan for 1/2/3 years. Domain will be free till the web hosting plan remains in active status. Free Domain One free Domain (.com) with purchase of every new Value and Unlimited plan for 1/2/3 years. Domain will be free till the web hosting plan remains in active status. We provide you all the best web hosting features in Malaysia that others are missing. 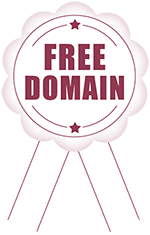 Lifetime Free DomainBuy Value or Unlimited hosting plan for minimum one year and get any one domain name (.COM) free of cost. The domain name will be free till the time your hosting account remains active with us. Pure SSD StorageOur servers are powered with SSD drives and its 20x faster than spinning drives. Websites hosted on SSD servers loads 20x faster than websites hosted on traditional hard disk drives. Free SSL CertificateWe provide free SSL certificate with every cheap web hosting Malaysia plan. SSL secures your website and improves your website ranking. In the web browser, a green padlock and https protocol will be visible. Pro Website BuilderMore than 400 professional and responsive website templates are available. Choose your template and build your website in no time. No technical or coding skills required. Secure Email AccountsPOP3 / SMTP / IMAP protocols are supported to send and receive emails. You can use email clients or web mail to access the emails. cPanel Control PanelManage every aspect of your linux shared hosting account from cPanel control panel. Add domain, sub-domains, add-on domains, emails, database etc. 1-Click InstallerAt a few clicks you can install apps like WordPress, Joomla, Drupal and over 400 such apps using Softaculous 1-click installer. It's integrated into cPanel control panel offered with our cheap web hosting Malaysia plans. Website Backup & RestoreSafeguard your complete website files, folders, Databases with automatic daily cloud backups. We charge additional for website backup and restore service. Built-in Page CachingAccelerate your website performance with APC, xCache and OpCache. Enable caching feature for your website to serve web pages faster to your site visitors. Latest PHP & MySQLWe have latest and stable version of PHP and MySQL installed on our linux shared hosting servers in Malaysia. SSH Access (Jailed)We provide SSH root access with basic shell commands and its usage is restricted to your account. To request the access drop an email to the support team. Instant Account SetupGo online instantly! All Web Hosting packages are setup immediately upon payment confirmation. Global Data CentreWe have our servers housed inside a state-of-the-art datacenter facility with multi-tiered network to deliver unrivalled uptime. You can select the server location at the time of sign-up for no additional cost. Free Website MigrationAre you unhappy with your cheap web hosting provider? Switch to MilesWeb, our migration experts will move all our website data to MilesWeb. There is no additional cost for website migration or management. Malware Scan and RemovalWe defend your website against malware. The websites are auto scanned on daily basis and if we find any threats, we fix it for you. Looking for a different web hosting solution? Kick-start your own web hosting business. Create unlimited cPanel accounts and host unlimited websites. Host your WordPress website, blog or WooCommerce store. Jetpack is pre-installed in all WordPress plans. Fully managed DigitalOcean cloud services. Get more control and power to run your website and apps. Talk to our web hosting solution experts for detailed info on our web hosting Malaysia service. We're available 24/7. We provide one (.COM) domain name free for lifetime with our Value and Unlimited web hosting plan. To avail the free domain client must order the Value or Unlimited hosting package for minimum one year. Client can either register a new domain or transfer an existing domain to MilesWeb. Client must add the free domain to the shopping cart before making the payment for the web hosting plan. The domain name will be free till the time your hosting account remains active with us. The cheap web hosting plan can be ordered for multiple years and the domain will be free for multiple years. This offer is valid on new sign-ups only. Choose our cheap web hosting Malaysia plans and book your free domain now! We provide unlimited disk space and unlimited bandwidth with our shared hosting plans. Our aim is to empower the website owners by offering them flexible and scalable web hosting solutions in Malaysia with no disk space and bandwidth limits. We have not set a cap on disk space or bandwidth usage. The web hosting users must comply to our TOS and Unlimited hosting policy. We will not restrict the user on space or bandwidth required for the normal functioning of the website. This doesn’t mean that large websites that are suitable for running on a Virtual Private Server or Dedicated Server will be accommodated on a shared hosting platform. The unlimited web hosting plan is recommended for small and medium size websites. It’s very rare for a user managing such website to exceed our usage policy. Using the unlimited web hosting for file sharing, backup, games, etc is prohibited. Refer the unlimited hosting policy page to view the complete details. Choose our unlimited cheap web hosting Malaysia plans to launch your website.